French inventors and pioneer manufacturers of photographic equipment who devised an early motion-picture camera and projector. The sons of a painter turned photographer, the brothers displayed brilliance in science at school in Lyon, where their family lived. Louis worked on the problem of commercially satisfactory development of film; with his father's financial aid he opened a factory for producing photographic plates, which gained immediate success. The Lumières were well-established photographers and manufacturers of photographic equipment (producing up to 15,000,000 plates a year) when, in 1894, their father, Antoine, was invited to a showing of Thomas Edison's "Kinetoscope" in Paris. This American invention was a peepshow device used by one viewer at a time. On his return to Lyon, his description of the peephole machine set his sons to work on combining animation with projection. Louis found the solution, which was patented in 1895. At that time they attached less importance to this invention than to improvements they had made simultaneously in color photography. The Lumières quickly set out to create a combination camera and projector. It was the leap of technical imagination needed for a cinematic culture to emerge from Edison's novelty. Their new, simplified, and portable apparatus, which they called the "Cinématographe" (the word cinema is derived from it), consisted of a single camera used for both photographing and projecting at 16 frames per second. The screening of their first film took place on the 28th Dec. 1895, La Sortie des ouvriers de l'usine Lumière ( "Workers Leaving the Lumière Factory"), at the Grand Café on the boulevard des Capucines. Audiences were thrilled, it brought wide public acclaim in Paris. It is considered the first motion picture, the day when cinema met history. A new form of art would soon be available to all, with an immediate and significant impact on popular culture. Word of it spread worldwide. The brothers paved the way for a new form of human creativity. Then, they presented the first newsreel, a film of the French Photographic Society Conference, and the first documentaries, four films about the Lyon fire department. 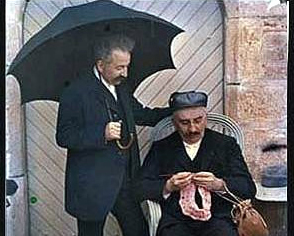 Their first films (they made around 45 in 1896) recorded everyday French life, others were early comedy shorts. The Lumières went on tour with the "cinématographe" in 1896 - visiting Bombay, London and New York. By 1897 they had a well trained crew of innovative cameramen and projectionists, who were sent all over the world to show films and shoot new material. The brothers commercially promoted their invention in England, Belgium and Germany. Two years later, they had sold hundreds on five continents and boasted a film catalogue of over 750 films. During much of the 20th century, the Lumière company was a major producer of photographic products in Europe. Their final public film event was held during the 1900 Paris Exposition during which they projected a film on a gigantic 99x79 foot screen. The brothers stated that "the cinema is an invention without any future" and declined to sell their camera to many filmmakers such as Georges Méliès. Louis continued his work on pictures and turned his attention to colour photography. In 1903 he patented the "Autochrome" colour photography process and developed other products such as loudspeakers. Auguste focused his interests on biology and medicine. He became a pioneer in the modern research and treatment of wounds, and he registered over a hundred patents, such as the homonoid forceps. In 1915 he perfected a revolutionary sterilized "treatment-bandage" the "Tulle gras". Though Thomas Edison is often widely considered the father of "moving pictures," French inventors Louis and Auguste Lumière were technologically and artistically of equal or greater importance to the development of cinema. Autochrome was the first commercially successful method of creating a color photograph on a single plate. The process, patented in 1904-07, involved covering a special photographic plate, with small grains of potato starch dyed red, green and blue (RGB) and then applying a thin film of "panchromatic" emulsion (equally sensitive to all colors). The process is based upon the fact that color vision uses the three primary colors: red, green and blue. These are called the "additive" primaries, which are different from the "subtractive" primaries used in printing: yellow, magenta (purple) and cyan (blue-green). Autochrome produced transparencies rather than actual photographs, and the transparencies had to be projected onto a screen or viewed through a hand-held viewer. The potato starch grains were about 1/40 mm (1/1000 inch) in diameter. They acted as tiny color filters during the exposure of the plate. When the plate was seen in transmitted light, the three-color filter layers re-created the color image. The plate was reversal processed, yielding a positive image. It required a very long exposure, about 50 times longer than the best black-and-white plates of that time. After it was exposed, the plate produced a transparency composed of small dots of color. Since these dots were too small for the human eye to detect as separate, they gave the appearance of mixed colors. Despite its limitations, the "Autochrome" process paved the way for the commercial success of color photography. It remained one of the most popular methods until the 1930s, when subtractive color processes replaced it. Are you Louis & Auguste Lumière?